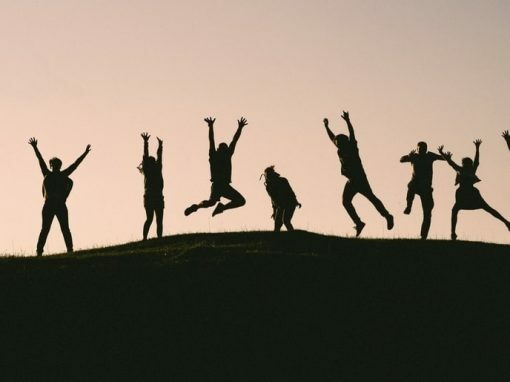 As you most likely know, church crowdfunding comes stocked with incredible potential to raise money for a multitude of different activities, like mission trips, youth group activities, community support, and more! Better yet, with providers like Bonfire, hosting an online church crowdfunding campaign is totally free, which means your church keeps all of the money you raise and you can go further with your mission. Sell merchandise with your church crowdfunding campaign. Use matching gifts to maximize your Christian fundraising. Tell a story within your church crowdfunding campaign. Try a text-to-tithe campaign for Christian crowdfunding. Host a church crowdfunding event. If you’re ready to further your mission and use Christian fundraising to its fullest potential, let’s dive in! Bonus! Check out our Top 7 Alternatives to GoFundMe if you’re looking for an excellent crowdfunding platform. 1. 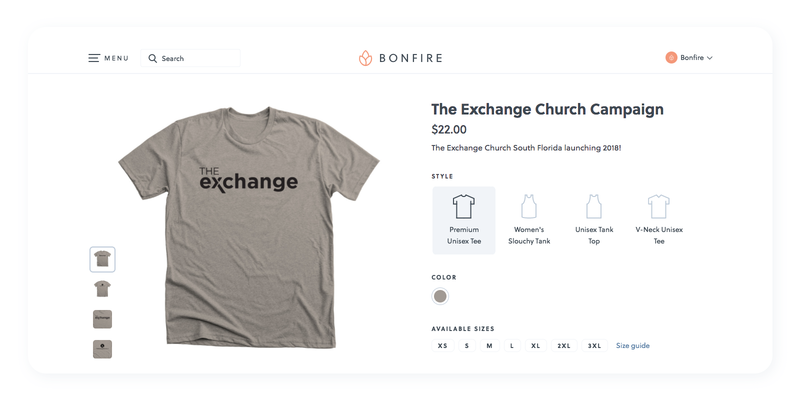 Sell merchandise with your church crowdfunding campaign. Selling merchandise is a fun and exciting way to raise money for your specific project from your members of all ages. Plus, selling merchandise provides an incentive for your congregation. If your church members are receiving something in return for making a contribution to your project, they’ll be more inclined to give! Products. 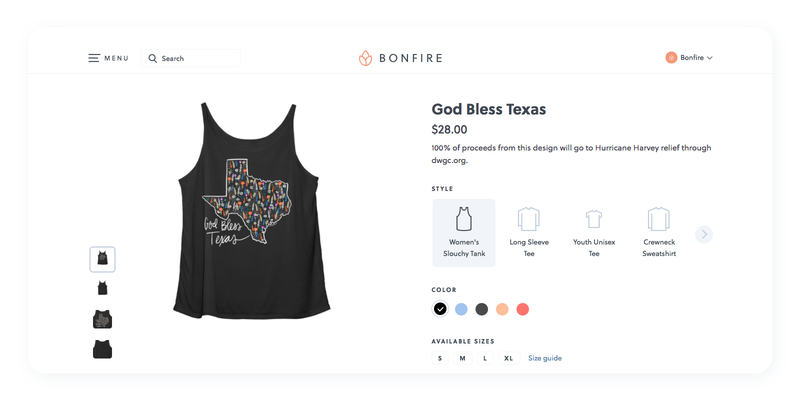 You’ll first need to choose your products and with Bonfire’s item catalog, you’ll have plenty to choose from, like t-shirts, tank tops, and sweatshirts. Design. Next, you’ll design your apparel with images from Bonfire’s library or your own. Price. With Bonfire, you can set your price! Factor in the base cost and determine your profit margin. Dates. Schedule your campaign! Your Bonfire campaign can last anywhere from 7 to 21 days. Page. Your fundraising project’s page can feel just like your church. Upload videos and include compelling copy so your congregation knows it’s you. Promote. Spread the word about your campaign through email and word-of-mouth. Don’t forget about social media, either! The more individuals who know about your fundraiser, the more merchandise you can sell! 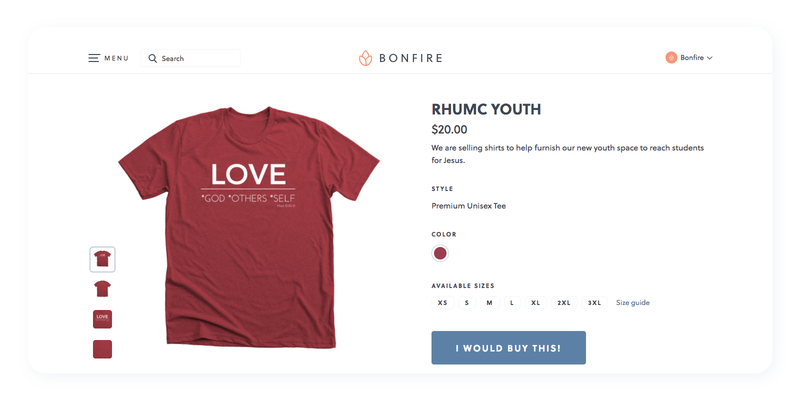 T-shirts are a popular item to sell when using a fundraising site. They’ll unite your congregation and spread the word about your church. 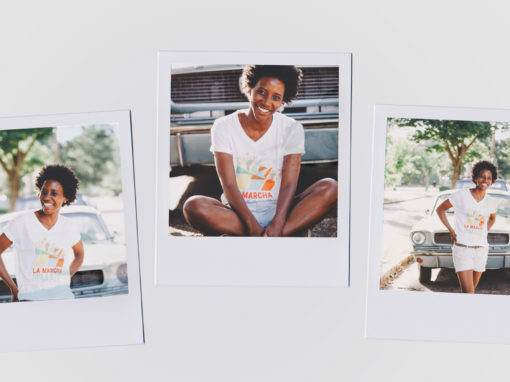 High-quality apparel is an excellent and nearly effortless way to build a community through visual association. 2. Use matching gifts to maximize your Christian fundraising. With the help of your church members, you can double or in some cases, triple your gifts! Matching gifts are corporate giving programs wherein your eligible members can submit their contributions to the employer and their employer will match their donation to your organization, as long as you’re eligible. It’s important to note that some employers do not offer gift matching for religious organizations but may still contribute to different projects, like food banks, for example, even if they are run by a religious organization. While it may be harder for churches to find matching gift programs that will donate to them, you can use matching gifts to crowdfund for religious-affiliated nonprofits and other projects your church supports. Most gifts are matched on a 1:1 ratio, though some are matched on a 3:1 ratio. For example, on a 1:1 ratio, if your church member gives $100, their employer will give $100, making your total donation $200. Employers typically put a giving minimum and maximum amount on their matching gift programs. The typical minimum is $25, but maximums vary quite a bit. Some are smaller amounts in the few thousands while other companies don’t apply limits until tens of thousands of dollars. By marketing matching gifts throughout your crowdfunding campaign, your church can raise twice as much money! Be sure to promote matching gifts on your fundraising page, in donation forms, and in emails and social media posts. Include easy-to-read visual instructions on how to submit a matching gift request to an employer. If your members know how much of a difference their matching gift request can make for your organization, they’re more likely to submit their paperwork! 3. Tell a story within your church crowdfunding campaign. Your campaign will benefit from being visually-pleasing so you’ll want to include attention-grabbing aspects on your page. Powerful photos. Share photos of your church’s congregants on your crowdfunding page. This will make your congregants feel included in your community and involved in the campaign. Plus, when they share your fundraising page on their social platforms, the page will portray direct ties to your church members. Impactful videos. Post impactful videos on your church’s crowdfunding page and inspire your congregation to be part of this project. Make sure these videos show how your church fulfills its mission in the real world and features the community members who have been supported by your church. Giver acknowledgments. When your members give to your church, they help to ensure that your good work continues. Recognize their important contributions by thanking them on your site. In addition to online recognition, don’t forget to send each of your supporters a personalized acknowledgment through their preferred channel, such as email or text, to thank them for supporting your church’s mission. Keep in mind that sites like Facebook prioritize photos and videos in their newsfeed algorithms so if your fundraiser links include that type of content, it’s more likely to appear at the top of people’s feeds. Don’t forget to make all of your visual content high quality in both resolution and spiritual meaning so that your community understands where your church’s heart lies. 4. Try a text-to-give campaign for Christian crowdfunding. By starting a text-to-give campaign, you’ll be providing your congregation with as many ways to give as possible, which results in more revenue potential! Your church will need to do some research before deciding on a text-to-give provider. You’ll need to pick one that fits your organization’s needs and your budget, and of course, is secure! Text your designated phone number. Church members will text your phone number with the amount they’d like to contribute or a shortcode specific to your campaign. Click the link. They’ll receive a text back that includes a link to complete their contribution via email or online donation form. Confirm their contribution. Depending on your provider, members will either hit send on a pre-written confirmation email or they’ll be redirected to an online donation form that they can fill out with their personal and payment information and submit. Bonus tip for large churches: If your church has multiple campuses, your members will want to give to the campus on which they worship. As your church is looking for a mobile giving provider, consider one with a multi-site giving option that makes it easy for your members to choose the campus they want to support. You’ll want to share instructions on how to give via text, so your congregation isn’t left in the dark and your text-to-give software gets used. You can share these on social media, through email, or in your newsletter. You can even host an in-person training session so your congregation can ask any questions they may have! 5. Host a church crowdfunding event. Hosting a crowdfunding event is the perfect addition to your campaign. It gives your congregation an entertaining way to engage with your organization and encourages giving! 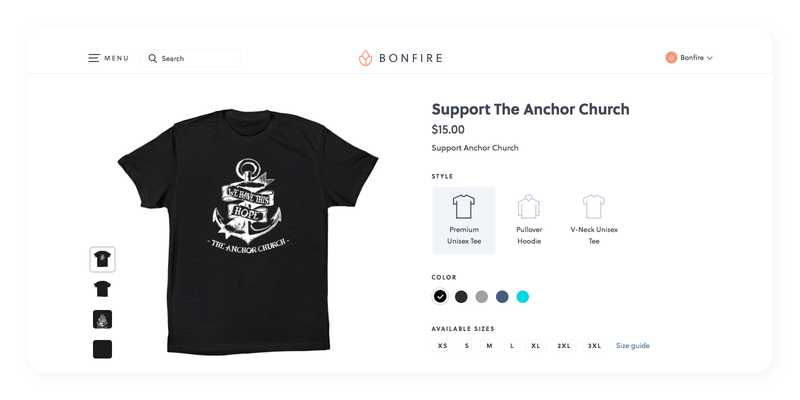 In addition to hosting a campaign using Bonfire’s online fundraising page, your church can also sell shirts during your event. Just accept orders using a t-shirt order form (use our helpful template for guidance). After the event, you can order the t-shirts in bulk using Bonfire Supply and send them directly to your members! When deciding your event, keep your congregation and their demographics in mind. If your church is made up of mostly adults, a themed youth group party might not be your most successful option. Think about a date and time for your event. Be sure to select a date when most church members will be able to attend. Seeing as many adults work from 9-5pm during the week, you’ll be better off selecting a weekend for your event! Establish your budget. Think about your event venue and consider the tables, chairs, refreshments, and snacks you might need for your event. Make sure you can fit it all into your budget! Recruit volunteers. Ask the individuals who are most involved in your church to participate and help lead your event. You’ll need extra hands for marketing and setting up the event. Market your event. With the help of your volunteers, you’ll want to spread the word on social media as well as through email. You can even try giving some members calls, too! Sell tickets. Determine if you’ll sell different ticket packages or just one flat price for all. You should also consider selling tickets online for guests’ convenience. Set up. Make sure your venue is all ready for your guests! Here’s where you’ll put your volunteers to work. Have them set up tables, put out food, and do anything else necessary to get your event started. Thank your attendees. After your event has concluded, thank all your members who attended for their support, whether that be financial or moral. You should consider all of the different ways you can get your congregation involved with your event, outside of attendance alone. We’ve already mentioned that volunteers will play a key role, but you can also reach out to your church community to see if they’d be interested in sponsoring the event through their business, assisting with item procurement for a silent auction or raffle, or even donating their talents for the evening entertainment. Remember: your church congregation is what will make the difference between a lackluster fundraiser and an out-of-this-world event, so work with your church to get creative and have fun! Now that you have our 5 easy strategies for maximizing the gifts received through your church crowdfunding campaign, there’s nothing holding you back from furthering your mission and spreading your light throughout your community! Bonfire’s How to Ask for Money Online. Sometimes raising money online is easier said than done. To connect with supporters and provide positive experiences, check out our helpful tips! Bonfire’s How to Design a T-Shirt. Selling merchandise is an easy way to excite and unite your supporters while raising money! 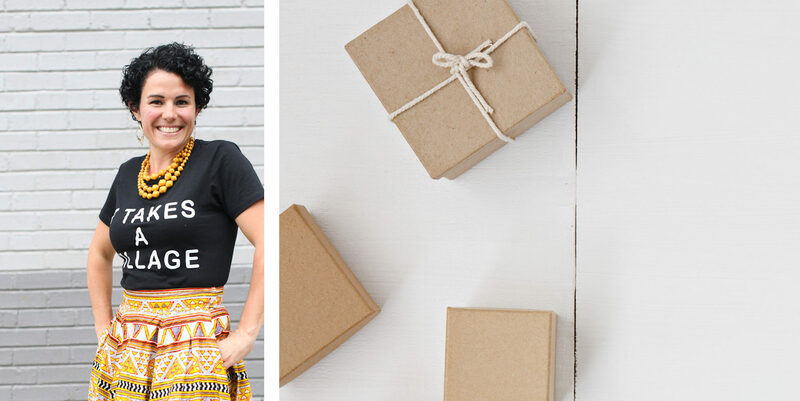 Check out our tips on designing a stellar, attention-grabbing shirt. Fundly’s 57 Church Fundraising Ideas. Looking for more great Christian fundraising ideas? Check out Fundly’s list to find something your church and congregation will love. Are you ready to start raising funds? 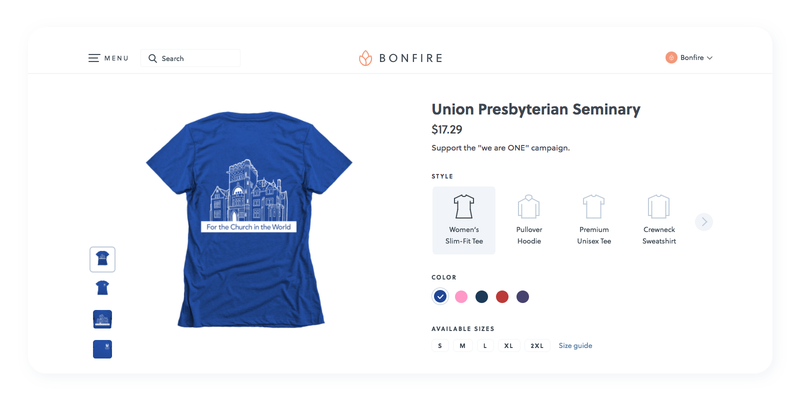 Create a Bonfire campaign today and sell t-shirts to raise funds.